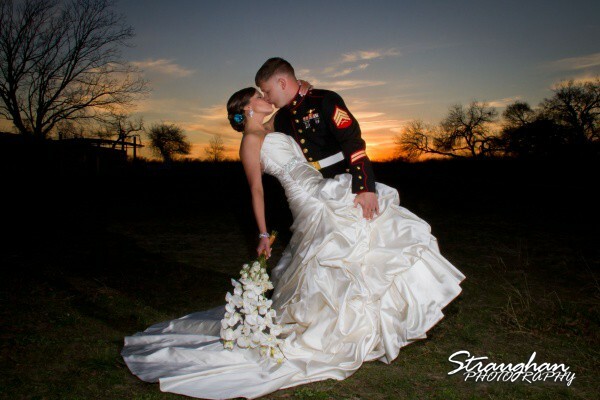 Kerri and Stephen were married January 14, 2012 at the First United Methodist Church in Seguin. The bride chose a beautiful deep red for her wedding. Her bridesmaids each wore long jeweled gowns and carried white hydrangeas, white roses and green hypericum berries. The reception that followed the wedding was very elegant thanks to the beautifully made decor. The room glowed with chandlers, three down the center of the great room, and ivory draping. The tables were beautifully decorated with red roses and white hydrangeas. The centerpiece for the room was a custom built cupcake table that was seven feet tall and adorned with red tulips. It looked great. The couple and their family had a great time and we wish them the best!